Here I was thinking that I was just a klutz on the bike because I wasn’t used to it. Not so. Apparently I’m just a klutz, period. 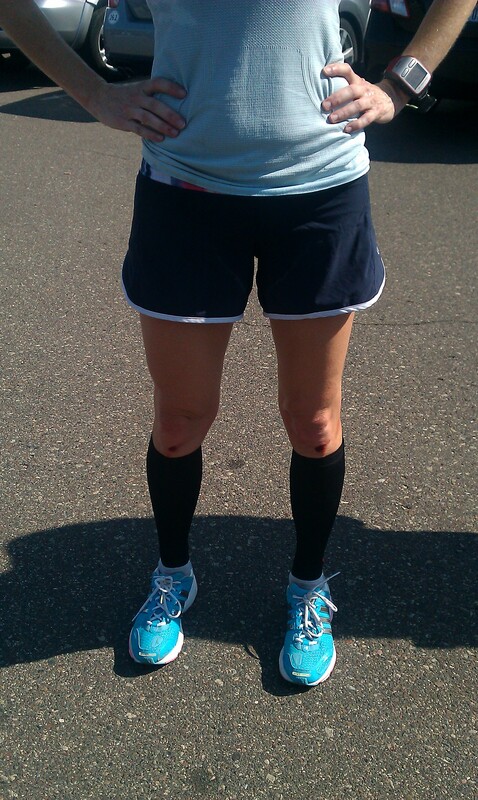 Check out my knees (and you can’t see it, but I think my right index finger is sprained) from my fall on my run today. Ugggggg. Ignore the ugly hair – you’d look like crap too if you just ran 20 miles. At least I have cute running shoes. And my fall was only at mile 9 of a planned 20 mile run. I’m lucky like that. 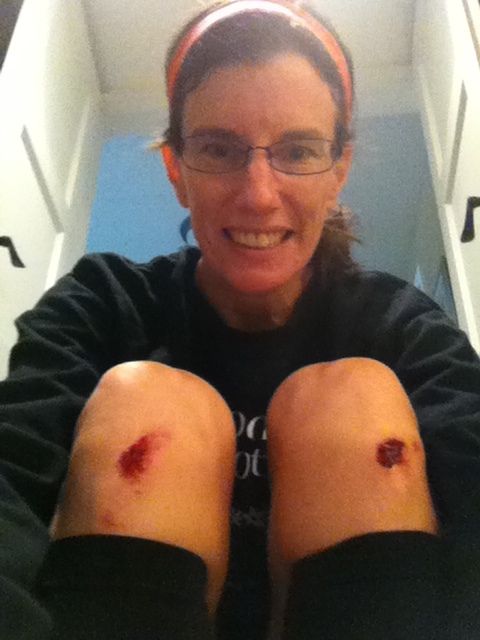 So now my knees match my elbows from fall after fall after fall on my bike. 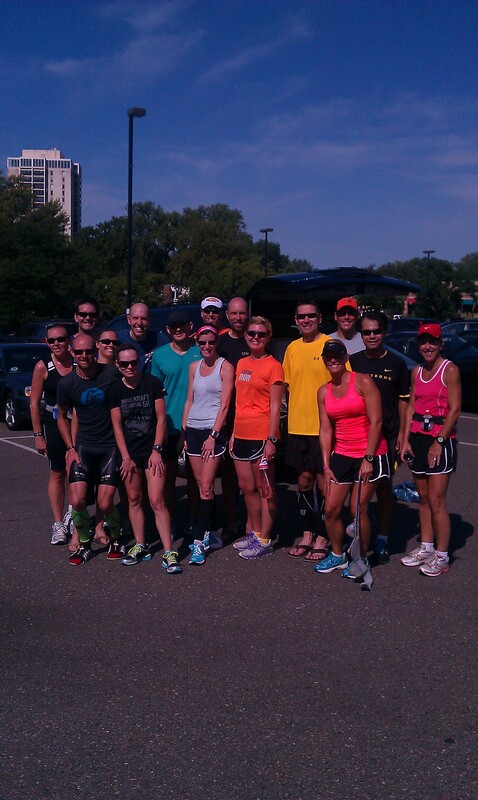 Here is the training group that you all hear so much about (about 1/2 of us are training for Chicago and the rest for Twin Cities) So much fun! Looks like a fun group! 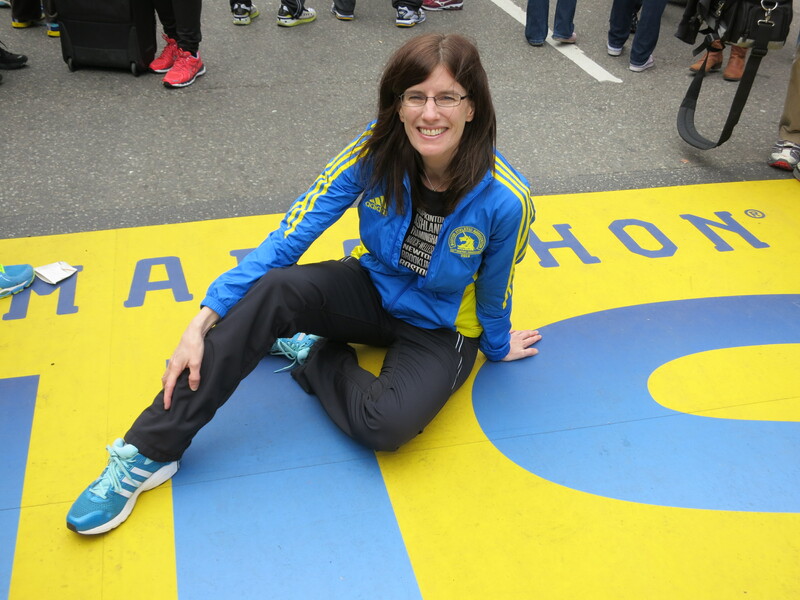 Sad for your knees, especially that you were only at mile 9. Way to get it done anyway and to be TOUGH. 🙂 Congrats on the first 20 of the cycle. Ouch! Sounds like something I would do. Great job with the 20!! Great 20 miler! But how the heck did you fall?!?! We were running downtown Minneapolis on sidewalks at that point and there was a tree with low branches, so I was looking at that and trying to duck to avoid having my head chopped off and didn’t see that the sidewalk was uneven and down I went! Haha – ouch! Very impressive pace for 20 on a relatively high mileage week! Can’t wait to see you take some names in Chicago! I did a 5K today and my friend was saying she avoided the sidewalk for fear of that very thing! Ouch–looks very painful. Twenty miles–hard to imagine that distance just yet. Nice!